Following are the step by step instructions to setup Learndash myCred Leaderboard. From myCred Default Points > Learndash Leaderboards Options > General options allows you to set up leaderboards. 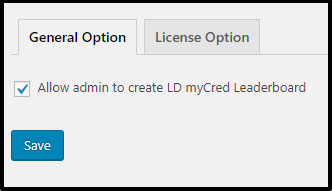 Simply check the option Allow admin to create LD myCred Leaderboard to enable leaderboards. License options can be configured from this section. Enter the license key to get the updates. The license key can be found in the inbox of your email id that was used to purchased the addon. Click on the submenu Learndash Leaderboards on myCred default points. We can create leaderboards from here click on add new to create one. The leaderboard will list the selected number of the user (meeting the criteria) on the shortcode page. Note: Number of users can be equal to the total number of users present on a website or it can be less than that. From here we can select to show the points of courses, lessons, topic and quizzes. There are two types to time filters one is default time period that is Daily, Weekly and Monthly and another one is Custom Date Range. This time filter will filter the points earned by the users today. It will show Leaderboard is empty if no one has earned the point today. This time filter will filter the points earned by the users this week. Monthly will show the points earned by the users in the current month. From here we can select custom start and end date, so it will show the points in leaderboard earned by the users between the selected dates. This field creates the shortcode according to the selected fields. Copy this shortcode and paste in the page, so it will show the leaderboard.